Since older system restore points are deleted after some time, it is always good to create some new regularly. But to always have to browse through the countless menus day by day can be really annoying, that is why we will use Windows' Notepad and Scheduled Tasks functions to ease our lives. When saving, make sure to not save it as text document but select All Files from the Save as type dropdown menu and name it something like automatic_sysrp.vbs. vbs is the type of file here, make sure you have it correct, since otherwise the script will not be executable. Now that you have created the script, you can doubleclick it to create a system restore point. 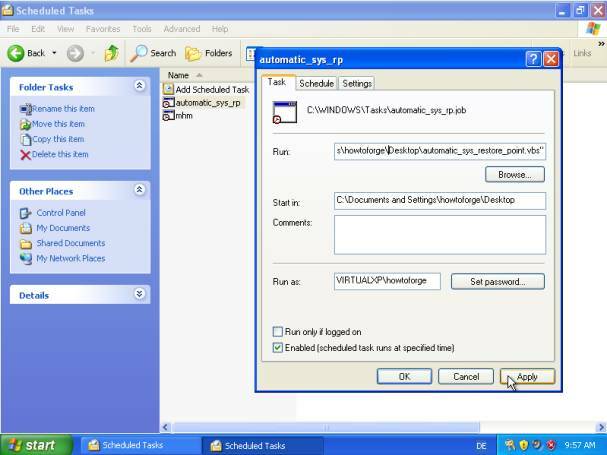 But to have it done automatically, we are going to use Windows' Scheduled Tasks function. Therefore, enter Start > Control Panel > Performance and Maintenance > Scheduled Tasks. Select File > New > Scheduled Task from the control bar. Give it a name, rightclick it and select Properties. In the opened window, browse the location of the vbs script you just created and go to the Schedule tab. Enter a time when the restore point shall be created and click on Apply when you are finished. A new system restore point will now be created at the time you specified or on doubleclick upon the script. Thank you so much for the such a valuable information.